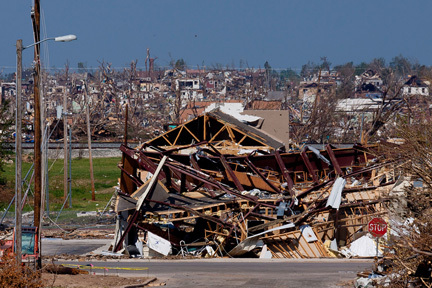 Joplin MO, June 4, 2011–The EF-5 tornado on May 22, tore a path through Joplin seven miles long and half a mile wide. FEMA is in the city to provide assistance to the disaster survivors. FEMA Photographers: Jace Anderson (front) and Steve Zumwalt. Operation Photo Rescue is planning a copy run to Joplin, MO October 7-8 at the Joplin Public Library, 300 S. Main Street. The hours of operation will be 9 am to 6 pm Friday and Saturday. The EF-5 tornado that tore through Joplin on May 22 destroyed one third of the town and killed 159 people. Because of the scope of the destruction, OPR decided to move the date from September to October. Destruction from a tornado presents a different challenge to saving photos, because so many are blown miles from their home. In Joplin photos have been reported as far away as 218 miles. Immediately after the tornado, Angela Walters of Pryor, OK saw the need to rescue photos from the debris. She set up a Facebook account called: Lost Photos of Joplin and teamed up with the First Baptist Church of Carthade. To read more about more about the race to save the photos, see Scattered Lives in the Joplin Globe. At the time of the article the photo count was 8,000 and now it stands at 16,000 plus. Operation Photo Rescue is happy to be in partnership with Lost Photos of Joplin and the First Baptist Church in Carthage. Besides the church, people may also drop off found photos at any of the Southwest Missouri Bank locations. This photo project is the only one authorized by the City of Joplin to house the recovered photos. awesome post! Keep up the great work!